Issue Four is one of the placiest yet… each city and country (and museum!) 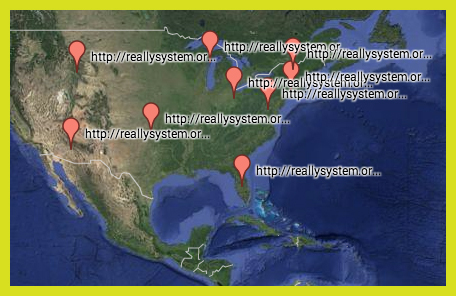 mentioned in the issue is now on the Places Of Really System map. Issue Four brings us our first two stops in Africa! There are 16 pieces in Issue Four with a total of 2,286 words and (1,216 unique) 17,268 characters, by 12 poets. Longest pieces (by words ):Parachute (334); In the Basement of the Penal Colony, Version 2.3, Rimbaud Remembers (316). Shortest pieces: [16901 – 17000] (68); [11601 – 11700] (73). Highest vocabulary density (total words / unique words): MicroGod Schism Song (933.3). There are 19 pieces in Issue Three with a total of 2568 words, 15,190 characters, and 1,317 unique words by 14 poets. Longest pieces (by words ): Notes I (289), Harbor Lights (264). Shortest pieces: Yelp Review: Planned Parenthood of Greater Orlando (41), The Money Weapon (51). Highest vocabulary density (total words / unique words): Yelp Review: Planned Parenthood of Greater Orlando (921.6), The Money Weapon (878). Lowest density: Harbor Lights (647.7), Hope in a Yellow Dress (669.3).